FACT: Coloured bags are always more exciting than white ones. The simplest way to make a coloured carrier bag is to use a coloured film, but as there are more colours available than in Joseph’s techni-coloured dream coat, it just isn’t possible to stock every single colour of film. If we don’t have the specific pantone you are looking for in stock, or would like a coloured printed paper bag, we have a clever method of getting round it. This is called flood printing. We take a film colour we do have in stock (usually white) and print it 100% in your chosen colour. Your bag will look exactly as you would wish, only the inside of the bag will remain the colour of the original film. So flood printing allows us to match your bags to your exact colour shade requirement, but it is also enables us to print a coloured bag with white / light coloured text. Light colours don’t show up very well on coloured films, so we flood print the bag but ‘reverse out’ the lighter text. 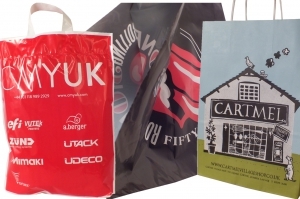 Flood printing offers us the opportunity to create some different eye catching bags. For example, you could use a coloured film and flood print it another colour which would create a bag that was coloured on the inside too instead of just being standard white. By using a clear film, you could flood print most of it and leave “windows” to show of the contents of your printed plastic bag! So with your next bag design, think a little outside the box and you’ll be amazed by the results.